When Emilio and Kate Ancaya started tinkering with green roofs eight years ago, the movement was almost nonexistent in the United States. The rooftops of Europe had been blossoming for decades at that point, but America’s buildings remained largely barren. They started small. A petite garden shed situated behind the couple’s former residence in Raleigh was their first project. “It’s gorgeous,” Emilio says. “It’s one of our best green roofs.” Atop the shed, a patchwork of delosperma, sedum, talinum, and euphorbia produce a spectrum of leafy green that canvasses its steep-pitched, gabled roof. Ivy sprouts from under the overhangs, forming a shaggy curtain that reaches down the planks above the door and window. Garden and shed are intertwined—a charming symbiosis of inert, man-made structure and nature. These days, more and more buildings across the country are trading shingles for succulents, as people recognize the economic, social, and environmental benefits of tackling sustainability from the top down. Today, the Ancayas find themselves at the forefront of this trend. 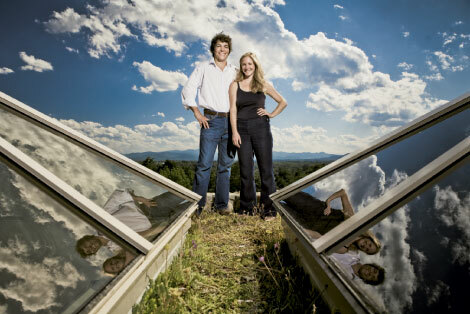 The husband and wife own and operate Living Roofs, Inc., North Carolina’s first company specializing in green roof services, and one of the few in the Southeast. They moved the business from Raleigh to Asheville a year-and-a-half ago. With a background in plant ecology, Emilio was working in stream and wetland restoration when he attended a storm-water management symposium headed by Bill Hunt, a professor at N.C. State University. Afterward, Emilio and Kate, who was then in graduate school for landscape architecture, began investigating projects in neighboring regions and attending conferences across the country. Emilio built small structures to serve as test roofs, adjusting soil depth and plant selection. Rather than whimsical gardens, the systems are more like living tarps, made up of thin layers of growing media and drought-resistant plants that manage storm-water runoff, protect the roof surface, and keep energy costs lower during warm months. Adjusting each layer—from the root barrier, water retention fabric, drainage apparatus, and growing medium—requires careful consideration of each project’s unique conditions, not to mention extensive knowledge about which plants will prosper on a roof’s harsh environment. Since that small start in 2006, the company has completed 25 projects. Emilio has supervised large installations in New York and Washington, D.C., and the company has since served as consultants on numerous projects. In April 2007, they put in Charleston, South Carolina’s first green roof on the city’s oldest church, Circular Congregational. The next year, they took charge of the green roof on the Southern Living Idea House in Madison County, a showcase of sustainable technologies and design features. And last September, they installed a system on the new fireside lounge at the Grove Park Inn. Maintenance is minimal for Naar, who has a contract with Living Roofs for eight check-ups a year. Regular watering is required during the first growing season, but only in extreme drought after that. Weeding and plant replacement may also be needed from time to time. On the tangible side, savings on energy costs and storm-water infrastructure quickly offset the price of the installation (materials included), which can range from $8 to $13 per square foot for a plug-planted roof or $15 to $25 per square foot for a prevegetated version. The industry has made leaps in other states where tax breaks and grants are enticing developers and homeowners to try the latest technology.